“I’ve been real busy lately. 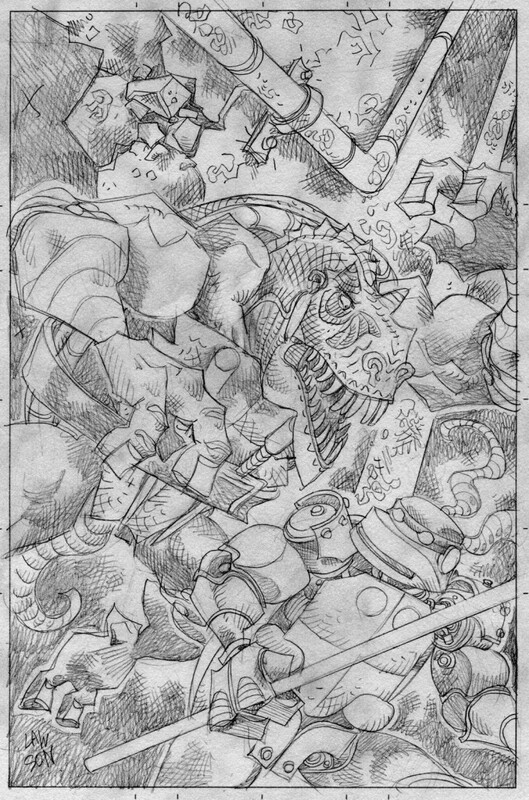 Pete sorta took me by surprise when he asked me how long before I thought I could get TMNT 32 pencilled. I originally was under the impression that I could push it off until later this year and that there was no real rush on it. Gladly though, Pete seems to be enjoying a burst of energy and it seems he was real eager for me to get it started, so for the past couple of weeks I’ve been getting 32 done and to Eric. Yesterday and the day before, I’ve turned my attention to getting the layouts and thumbnails for Tristan’s book done- which they are now and as well yesterday, I got to rough-pencil 32’s cover. I came in this morning and tightened up the drawing a bit as well as adding the background.